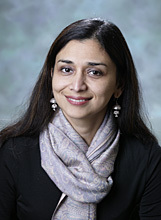 Dr. Uzma Haque completed her fellowship training at Johns Hopkins in 1999. After spending three years in rheumatology practice in Mississippi, Dr. Haque joined the Full-Time Faculty in 2003; she is based at the Bayview campus. Dr. Haque is an active faculty member at the Arthritis Center at The Hopkins Bayview Medical Center, and is actively engaged in clinical care to patients with general rheumatic and musculoskeletal disorders.